We provide mandatory safety and directional signage for commercial spaces across a diverse range of industries. Safety Glow Australia (SGA) are an Australian owned and operated company, with our off-shore manufacturing centre allowing us to produce premium quality signage at highly competitive prices. 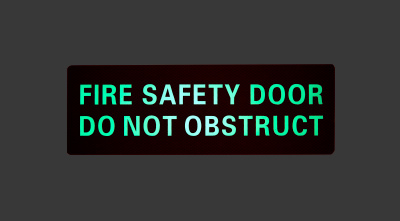 Our innovative approach to safety signage combines glow in the dark with reflective finishes. This combination provides assistance in a variety of emergency situations with and without other light sources e.g. illumination is required to see in darkness and reflective backgrounds are required if torch light is being used. SGA signs are all hand screen printed, this process ensures a thicker application of glow material, resulting in a high strength and long-lasting glow. Select our premium Glow Plus reflective option for signs coated in a prismatic reflective layer to provide reflection from any angle. 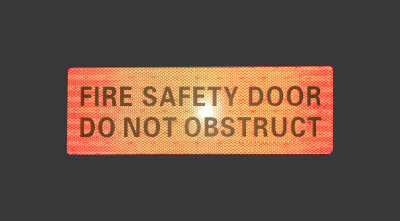 Reduce the ‘Fight or Flight’ reaction to emergency situations through both illuminated and reflective signage.